U.S. Chemical provides the ultimate storage solution for all of your hazardous waste needs. Our hazardous waste storage building is 100% customizable, which provides the flexibility for your hazmat storage solutions. 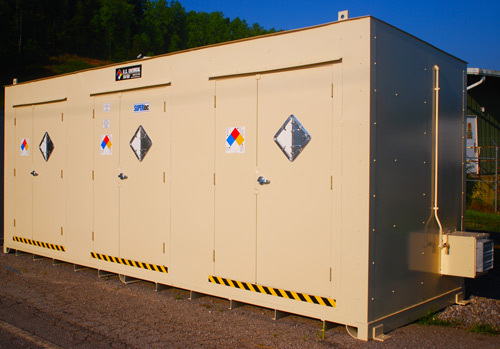 Our customizable hazardous waste storage building is made from 12-guage steel for increased durability and maximum protection. We offer the highest quality hazardous waste storage building on the market today. U.S. Chemical is dedicated to strengthening individual’s health by confining hazardous waste from the environment, including groundwater and water systems. We provide an extremely strong hazardous waste storage building to prevent spills, leaks or hazmat situations. Store your hazmat in our hazardous waste storage building to keep your personnel, facility and investments safe and protected.